A hard wearing, well made and covert shoulder holster specifically designed for Revolver side arm and their loaders. Capable of storing any size of revolver due to its open front design and an additional two revolver speed loaders on the opposite side. 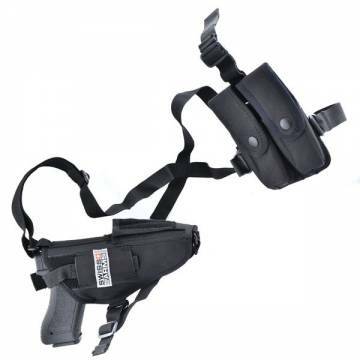 The unique design of this holster allows the user two switch the side arm and the spare loaders from the left to right position a matter of seconds. This is because, instead of strapping it utilizes fast-ex clips to attach the elements together. Fully adjustable to almost any size of user and well padded for comfort ontop of or underneath other tactical gear or clothing.